During the planning of a Phase III Systemic Lupus Erythematosus (SLE) anti-B cell therapy, the Sponsor company called on Pharm-Olam to assist in the identification and enrollment of patients. 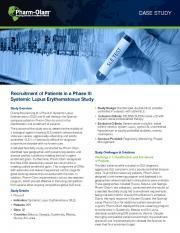 The purpose of the study was to determine the viability of a biological agent in treating SLE patients whose disease state was severe, aggressively advancing and poorly controlled. SLE is a notoriously difficult-to-diagnose autoimmune disorder with no known cure. To see the full case study, click on the image to the right.